Going to school and work at the same time after school hours is difficult for any student, especially for ESOL students. Last year, Mr. Moreno, the ESOL counselor, did a survey in which he found that 25% of the ESOL students work. Some work at a full-time and some at a part-time job. Students who go to work after school have different reasons for doing that. Some need money for themselves. Some must help their families. Some are earning money for college. Jose, a student in ESOL who is in the 10th grade works after school in a restaurant 8 hours per day (Monday through Friday). He says it is a difficult thing to do. "I have to work because I live by myself and I need the money to buy my food." But this can become a hard thing to handle. "Sometimes I don't do my homework because when I get home I feel tired and I go to sleep." Fernando another student who worStudying and Working Is Difficult after school 8 hours every day (Monday to Friday) says it is difficult doing both things. "It's hard for me because I don't have time to go home after school to relax a little of bit before I go work," he said. "Work time ends at 11:00 p.m. and I get home around 12 o'clock at midnight and I don't have time to do my homework." But sometimes he forces himself to stay up and do his homework. "If I do, then I sleep in class the next day," he said. 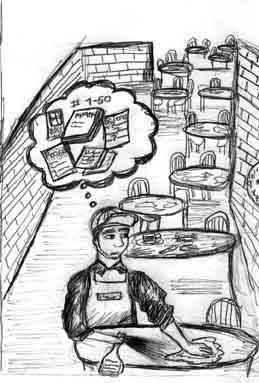 Dropping out of school is one thing that can happen to some students when they have a job. According to Mr. Moreno, "Students who start to work, sometimes quit school because they prefer to have money," he said. "One important thing is to balance school and work. It could be making a schedule because it helps to organize things and help to be successful at school," he added. Joel Sanchez another ESOL in 11th grade who works. "I work because I help my family and to earn some money because I'm going to college after I graduate," he said. Joel is able to work and get good grades, too. "I have been successful since I started to work, I do my homework and my GPA is 3.55," he said. Organizing things is one of the things that Joel does. "I organize my time, in respect to doing homework. I always spend one hour when I get home after school before go to work," he said. Joel and the many other students who work hope that they can work and study to help themselves and their families for a better future.